Brown leather sofa by Illum Wikkelsø for Ryesberg Møbler. Beautiful original patina to the high quality leather. Martin Borenstein sofa. This piece has been professionally restored. Beautiful dynamic walnut grain. Vladimir Kagan serpentine sofa for Directional. This piece has been upholstered in Knoll Classic Boucle. A iconic freeform curved sofa design. 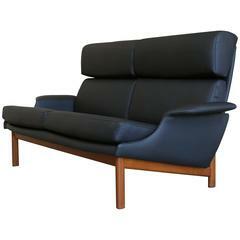 Leather "Adam" Settee by Ib Kofod-Larsen for Mogens Kold. This piece has been upholstered in a matte black leather.